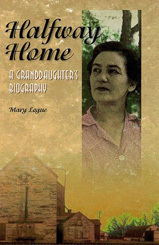 Non-Fiction | Mary Logue | Author. Poet. Rug Maker. They stand at once as silent reminders of time past as well as the hub of our daily lives. They are the focus of activity in every county—the site of political speeches, holiday parades, and community picnics. They are the courthouses of Minnesota’s eighty-seven counties. 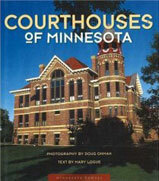 Writes author Mary Logue, “With a clock tower, the courthouse becomes metaphor, literally the ticking heart at the center of a county.” In this beautiful book are photographs celebrating the variety of Minnesota’s county courthouses. 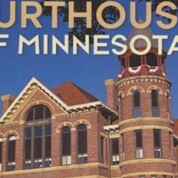 From the classic Beaux Arts dome atop the Stearns County courthouse to the unadorned simplicity of the Sibley County courthouse, this book offers a parade of some of the finest public buildings in the North Star State. Paired with Doug Ohman’s warm photographs in this newest book from the Minnesota Byways series is an essay by mystery writer Mary Logue that reveals the secrets of these buildings we thought we knew. Together they tell the story of these distinctly American structures, symbols of the ways Minnesotans live under the law—with justice, equality, and fairness. Mae McNally Kirwin was born in 1894 in Chokio, a small prairie community in western Minnesota. In 1926, the sudden death of her husband left Mae to support herself and her five children. These facts were well known, but for Logue, they were not enough. Determined to get to know her grandmother better, Logue sets out to assemble the bits and pieces of her grandmother's life. Along the way, Logue takes the reader-and herself-on a journey of discovery. Digging through forgotten bank records, old newspapers, handwritten census forms, family documents, and faded recipes, she pieces together the past. In the process, she tells a much larger story-that of a community, a way of life, a family, and a single woman's struggle to survive in a world that is both harsh and richly rewarding. Four essays by Mary Logue which document the trials of renovating her old Swedish farmhouse, and her observations on life in a small town in rural America. Bats and plaster lath fill her life with chaos and charm. 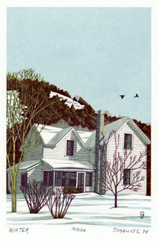 Four multi-color wood engravings by Gaylord Schanilec capture several of the buildings in this small Mississippi river town.